While his eight minute campaign speech included tried and true classic antisemitic tropes and conspiracy theories regarding Jewish control of the monetary system (in conjunction with Global Freemasonry naturally), and indeed the world, I guess such hate emanating out of the Arab world ceases to shock anymore, and the gallows humor of his no doubt empirically driven data on the percentage of Jews in the world who he’d classify as supernaturally evil gave me a rise. Don’t worry, he also morally breaks down the remaining 40% for us. I think you’ll agree that his bold belief in the far less than absolute evil of the Jewish people makes him a genuine Egyptian moderate. See video here, or by clicking the above image, and see transcript here. For me this is like watching an arab film in the old Israeli TV on Friday afternoon. He must be a Top Dog! It reminded me of the quip someone I know made about Jews, in their defence – not all of them are Shylocks! This gives the oxymoron,”unprejudiced antisemite”, a whole new different meaning. I must perform a serious self-examination to find out my place on the scale… Lesser? Slightly lesser? Maybe the 60% majority? What if he is wrong? 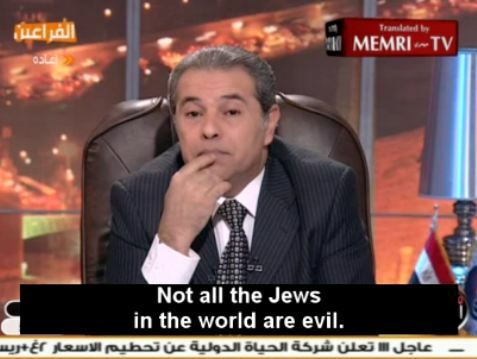 What if all of the Jews are 60-40? If so, which parts of me are the evil ones? I suppose my pancreas is not evil, and my appendix is pretty benign, but my tongue is definitely evil. My right eye and my left ear are probably ok, but at my age my knees are definitely evil. Geez, you simply could not make this stuff up. The followup question is – What percentage of Muslims are evil?